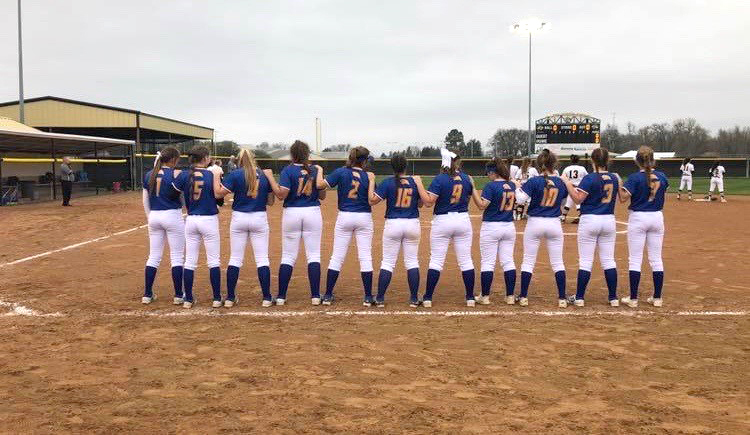 The North Lamar Pantherettes say the pledge before a recent game. The North Lamar Pantherettes invite softball fans to a fish fry on Tuesday, April 16, beginning at 5:30 pm at the softball field. For a donation of $10, fans will enjoy fried fish and all the trimmings with donations going to the softball program. Recognition of senior Pantherettes Keegan Fendley and McKayla Figueroa begins at 5:45 p.m. with the game against the Pittsburg Lady Pirates starting at 6:00 pm. Additional Pantherettes are freshmen Sloane Hill, Emma Layton, and Claire Stewart; sophomores McKenzie Dickson, Jaycie Hall, Karsyn Iltis, Noel Rainey and Macy Richardson, and junior Ashlyn Reavis.